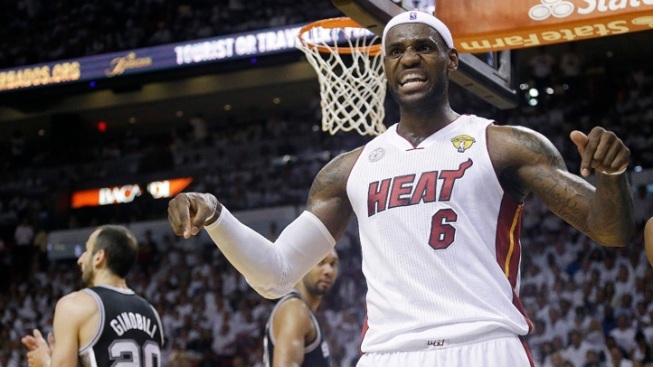 LeBron James cannot become a free agent until next summer at the earliest, but speculation is already rampant as to whether he will still be a member of the Miami Heat at the start of the 2014-15 season. James attempted to put that speculation to bed when he sat down with ABC News for an interview this week, telling Robin Roberts, "I'm happy right now being in Miami." 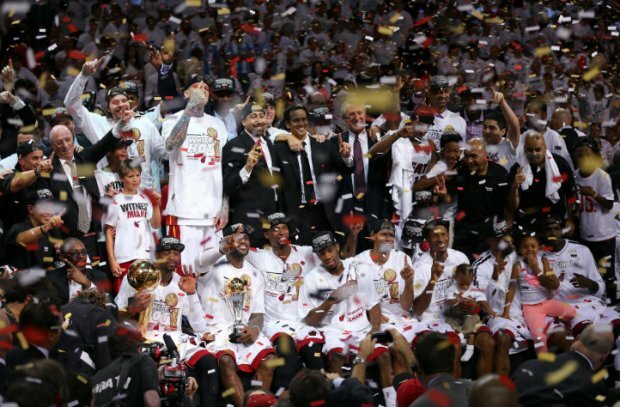 Heat fans share that happiness, having watched James win the league MVP and NBA MVP in two straight championship seasons. The summer of 2014 could be a historic NBA offseason if any of the Miami Heat's Big Three exercise their opt-out clauses. James, Dwyane Wade, and Chris Bosh all have player options for the 2014-15 and 2015-16 seasons. It is conceivable that one, two, or all three of the Heat's All-Stars could opt out, either for more money or more years (or both). James has been asked about the possibility of returning to his home-state Cleveland Cavaliers (as early as his second season with the Heat), and every week brings a new theory about James' future. While James stopped short of saying he will definitely stay in Miami for the long haul, he did make it clear that his decision to join the Heat three years ago has paid off. "I'm happy right now being in Miami, obviously winning two championships in a row and hopefully everything works out," he said when Roberts asked what criteria he would use to determine his next step. He also cautioned that he is not going to make any premature decisions, hinting that he would let the next season play out first. "But when that time comes upon us, I'll be able to tackle that," he said. The Heat are once again the favorites to win the NBA Finals, and if Miami can pull off a three-peat, it may be a little harder for James to walk away from the Heat. Team president Pat Riley has constructed a roster that complements James' strengths, and James' close friendships with Wade and Bosh also provide an incentive to stay in Miami. But until James' next contract is inked, speculation will continue to run rampant, regardless of how happy he says he is in Miami.